Today is the day we head off to the West Coast for 2 weeks. Cali Cali California we’re coming for you!! We started this morning off by eating our delicious cheesecakes we got the previous evening which filled us up for a good few hours. Before going to the airport, Penny took us to the Green Mile, a.k.a the mile of weed stores. It was actually incredible how many there were, nearly every other store were weed stores! And so the journey begins venturing off to California. The day started off with warm and decent weather which soon turned to be the worst storm I have ever witnessed. Full on hail stones, the size of small rocks which sounded like they were denting the car, and thunder and lightning every few seconds. Cars would be stopping under the bridges, something you would not see in England. We made it to the airport with an hour spare hoping we would make the flight. No surprise, ALL flights were delayed so the airport was heaving. We had a few hours to kill so we contacted our parents to update them and got a few snacks. After many announcements clashing, I had a bad feeling what had happened…yes…WE MISSED OUR FLIGHT!! Considering we were a few meters away from the gate door, we were so annoyed. They didn’t call our names, do repeated announcements..nothing! We found out we would not make our connecting flight, what a surprise! However, what was not expected was that the next flight was at 6am the next day, ahhh a nice night spent at the airport. Even though we were so frustrated, and our bags would get to San Francisco before us, we couldn’t help but laugh away over this…we were waiting for the bad luck to come at some point during our travels. 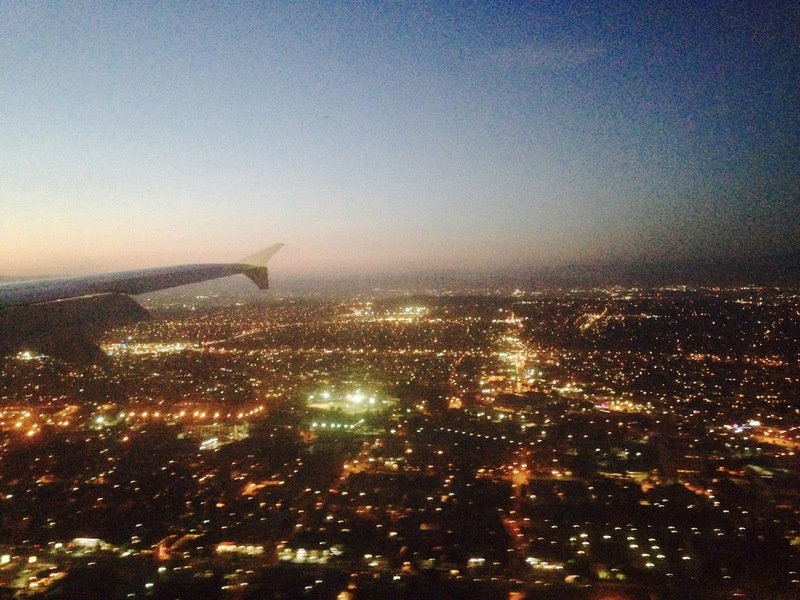 Anyway, we have landed safely in Los Angeles with the beautifully lit up city view as we were arriving at the airport. The picture above is obviously very bad quality but it just shows how lit up the city was, although it definitely doesn’t do it justice! Just a long wait until our next flight now. We have literally spent the last hour exploring LA airport to find food and as we can’t check in yet, it is proving to be very difficult. But we managed to find a Starbucks which has saved our lives!! Are you following me on Twitter | Instagram | Bloglovin’ | Pinterest ? "PADDLE BOATING & HIKING || USA TRAVELS"
"GETTING LOST IN SAN FRANCISCO || USA TRAVELS"